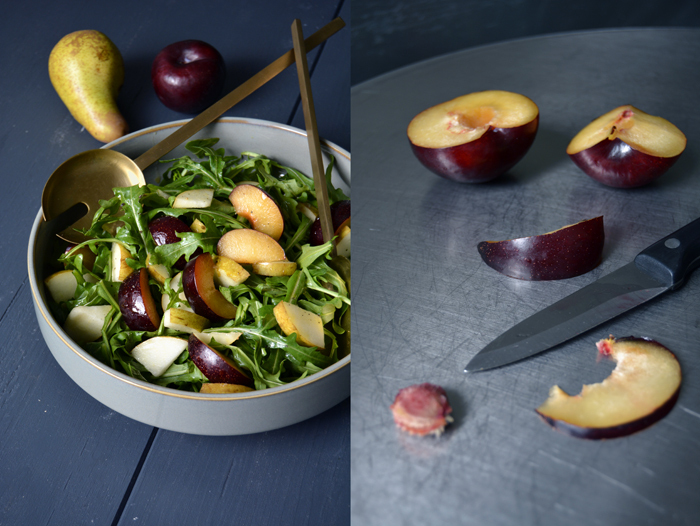 Here’s another one of the kitchen leftover mash-ups I mentioned yesterday: There were 3 bunches of rucola (rocket) on the window sill, Italian plums which started to look a bit sad and ripe pears, ready to be eaten just before they get soft and mushy. I tossed everything together in a bowl and mixed it with my new favourite summer salad dressing: olive oil whisked with freshly squeezed orange juice and a little orange blossom water. It’s fantastic, the citrus’ fruitiness merges wonderfully with the orange blossom’s flowery aroma and the warm olive oil. Citrus and olive oil is a delicious combination. One of my favourite recipes on eat in my kitchen features this glorious treat, it’s a very simple yet absolutely delicious Sicilian salad. The first time I ate it was at a farm in Noto where we stayed a few years ago. The lady of the house would make it for us for breakfast. She used the ripest oranges from the farm, cut them into fillets and sprinkled them with a little olive oil and dried oregano. It was a heavenly and eye-opening experience for me. I had never really thought of this combination before, mixing fruit with olive oil was quite new for me at that point and this morning treat influenced many of my recipes over the years. It taught me to be open minded and experimental, to combine various flavours, to mix what seems far away in taste but trust that it will lead to a satisfying result (which it often does). 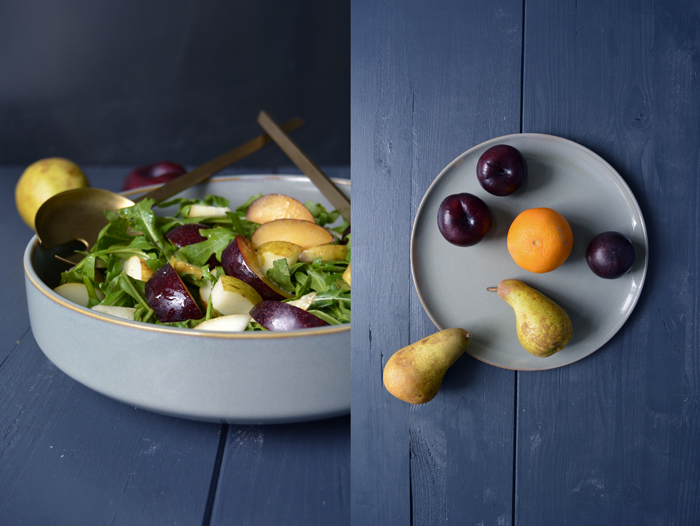 However, the combination of fruit and olive oil needs a strong partner, either a herb or spicy rucola leaves as I chose. 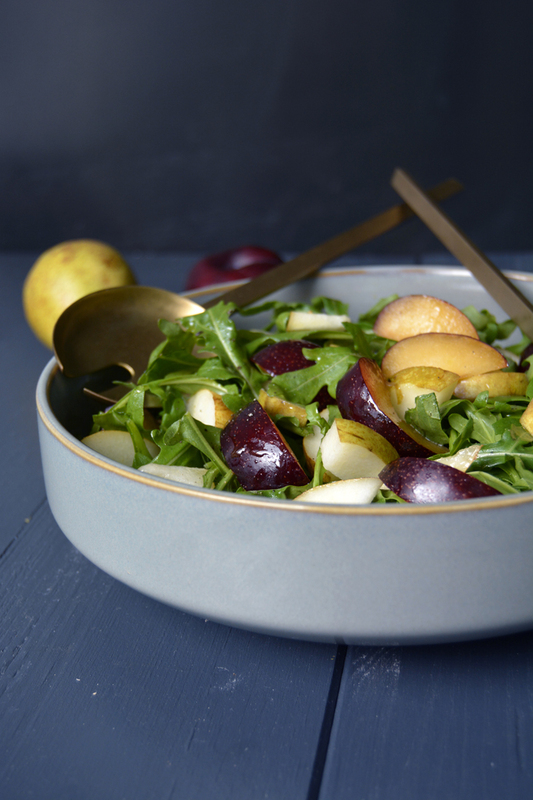 You could replace the plums and pears with any other sweet fruit you have at hand in your kitchen: strawberries, nectarines, figs or oranges. As long as they have honey sweet juices to add to the salad, they will be a good choice! 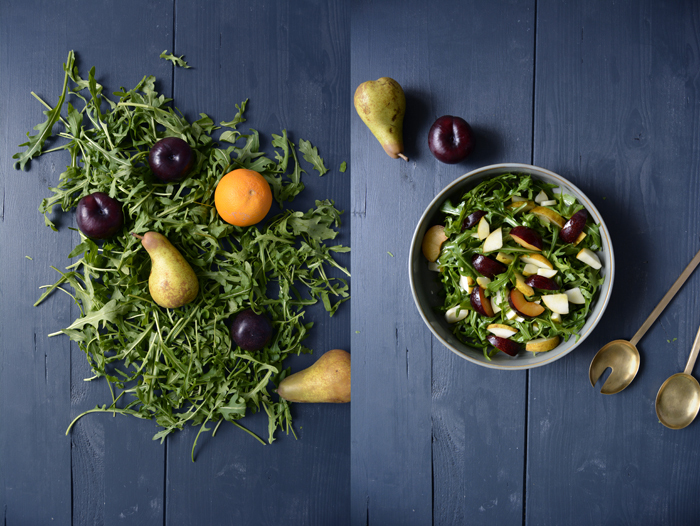 Arrange the rucola and fruit in a bowl. 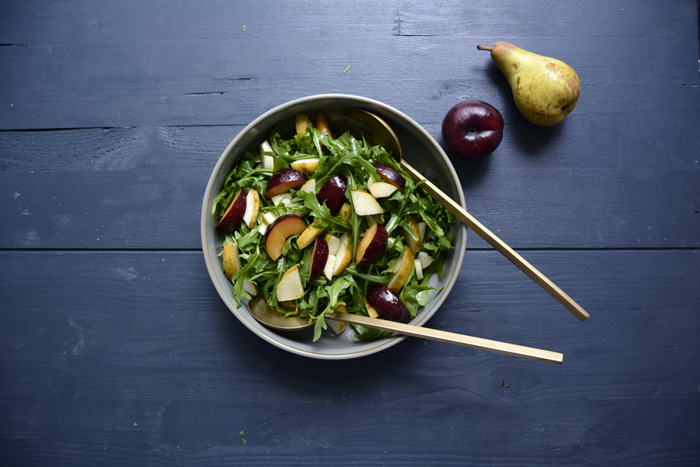 Whisk the ingredients for the dressing, season to taste and sprinkle over the salad, serve immediately.